At some point in your life, you are going to have your picture taken. For some people, that is on a daily basis. Now, I don’t know about you, but I am constantly retaking pictures trying to find the best lighting and get the best angle. We all want to look our best and camera ready. 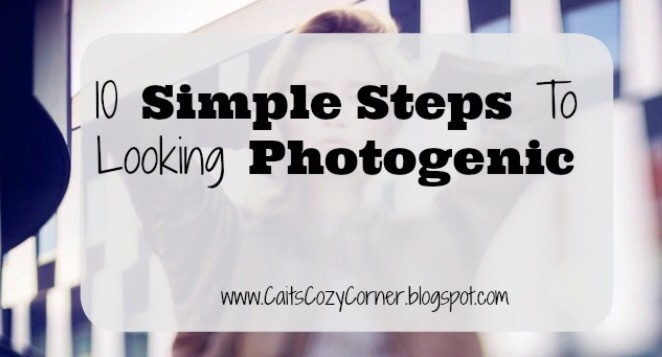 Well I have teamed up with Cait of CaitsCozyCorner to bring you a guest blog post on how to always look photogenic in your photos. Enjoy! Having your photo taken can sometimes seem a little frightening, especially when it seems that you never look quite as good in portraits as you do in reality. This is a problem faced by many people, but is quite easy to overcome. Being photogenic is a skill which you learn, not which you’re born with. That’s why I’m here to help you. We’ve came up with some of the best tips to instantly start looking better in photos. Nowadays, there are a lot of advises you can come across over the internet, but many people don’t practice them quite correctly. You know that hand-on-hip pose celebrities do to make their hand look slimmer right? I’ve seen a lot of girls trying to do the same thing but it doesn’t come as natural for them – they make more like a chicken-arms-pose. Well, to avoid these little mistakes, take a look at these tips for being more photogenic. Standing directly under a light casts weird shadows on your face, so stand facing a natural light source, such as a window, which is more flattering to your features. You can also position yourself in a spot where soft light hits your face from the side. I love posing near big windows for a lot of natural light that fills the photo and accents the features I want highlighted. A lower angle visually stretches your figure, making you look taller and leaner, but when seated a photo shot from just above you is way more flattering. I tend to love when photographers get those great flattering shots from above and usually find that it’s one of my best photos taken. To make your eyes sparkle, look at a light source such as a lamp which will create a flattering gleam in your pupils. Plus, it helps minimize the dreaded red eye! I also tend to add a bit of sparkle eyeshadow or a light white near the tear drop of my eye to highlight that particular spot. My eyes always tend to light up with that small trick! Go ahead and look through some of your old photos of yourself. Which ones do you love? Why? Look for a pattern that you notice. Perhaps it’s the high angle or the way you tilt your head. Next time you have your photo taken, make an effort to imitate your best poses and remember why you loved those photos of yourself. Photos usually highlight flyaways, giving you a gawky, messy look. Dry oil or a good pomade will help, but make sure you use it lightly. If you are afraid to use too much, spray on your hands and then lightly try to control fizz! Sometimes, if I don’t have any with me on hand, I’ll use a bit of lotion to help smooth those annoying little hairs! Facing the camera straight on can rarely be flattering, so instead turn your head slightly to one side or the other. This way you give your features a greater depth and highlight your cheekbones. Try to do the same with your body, but also cross one of your legs or just bend it to break up the shape. For me, I found my best photos are when I tilt my head slightly to the left. Play around with with tilting your head in the mirror and see which way you like best. Lean into the camera and stick your head out forward and tilting your chin down just a little bit. This will make your head will look bigger, giving you the optical illusion of a smaller body. I never knew this trick until a photographer shared it with me, took my photo and shared the results! It’s true and I try to work this angle when shooting some looks for blogs. As I stated above with head tilting, try to find out which side of your face looks better on camera. This differs from person to person, but studies say that most people’s more photogenic side is the left ( which is actually mine too! ). Putting your tongue behind your teeth when smiling is an old trick but it does work. It helps you avoid a too-wide grin and look goofy. But remember to always ‘smile with your eyes’, to look more natural. To do this, squint slightly to create small pillows beneath your eyes, giving them a half-moon shape. When taking group photos never stand the closest to the camera – it makes you look disproportionately larger. You should instead place yourself on an even plane with the other people in the photo. Now that you’ve got some great ideas for your best looks, it’s time to find a great photographer who can capture the best version of you! If you’re in the Atlanta area, you must go see Donald Chambers who has over thirty years of professional photographic experience. He studied at California’s Art Center College of Design and assisted with acclaimed studios before moving to Atlanta to start his commercial studio in 1984 .Donald prospered in that studio, focusing on a wide range of subject matters with clients such as Coca-Cola, Budweiser, Georgia Pacific and Alton Brown. After three decades, Donald has come back to his first love: photographic portraiture. He has a passion for working with people and capturing unique and authentic moments. He equally enjoys working with individuals, families, babies and couples. He is renowned for his masterful lighting in classical black and white along with vibrant use of colors. Donald shoots for as long as the subjects have energy and can provide quick reviews to ensure his clients see images that are suitable for framing! You’ll love everything he shoots! Be sure to check out Cait’s blog and show her some love! I hope you enjoyed her guest post! I know that I will definitely be using some of these steps the next time I have my picture taken! All photos retrieved from photographer Donald Chambers website.